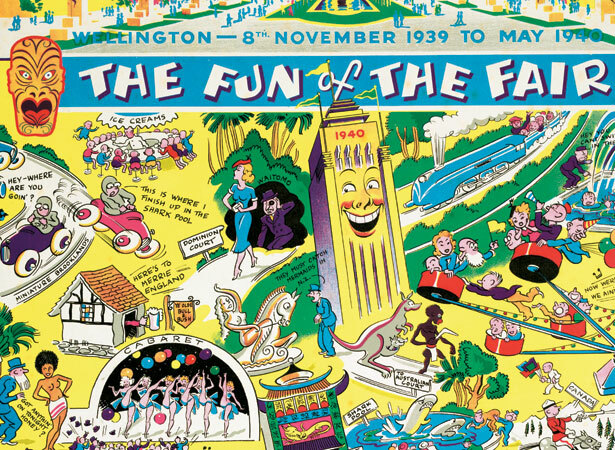 More than 2.6 million people visited the New Zealand Centennial Exhibition, which ran for six months at Rongotai, Wellington. It was the centrepiece of the centennial of the signing of the Treaty of the Waitangi. The exhibition covered 55 acres (22 ha) of land between Wellington’s airport and Rongotai College. Architect Edmund Anscombe designed the centennial fair to illustrate the progress of the country. His striking art deco buildings featured a soaring central tower and masses of electric and neon lighting. There were displays of industry, transport, a large Government Court celebrating the welfare state, and Māori and women’s courts. Playland, the exhibition’s amusement park, was popular, with the Cyclone roller coaster, the Crazy House and the Laughing Sailor particular highlights. But the outbreak of war affected attendance, which was lower than for the 1925–26 New Zealand and South Seas International exhibition in Dunedin (see 17 November). After the exhibition closed, the buildings were used for Royal New Zealand Air Force accommodation and subsequently as wool stores. They burned down in September 1946. We have 5 biographies, 8 articles, related to New Zealand Centennial Exhibition opens .